The cold you think you have might actually be allergies. Have you had an itchy throat, watery eyes or one too many sneeze attacks lately? You're not alone. More than 25% of Canadian suffer from allergies, and some of the most overlooked groups of allergens are those lurking in your home. Allergy and Immunology Specialist, Dr. Christine Song dropped by The Goods studio to talk about the allergens that could be hiding in your house. Allergies or just a cold? Some people mistake the allergy symptoms for a cold or a flu. Many people have allergies without even realizing it, or aren't sure what they are allergic to. Knowing what you're allergic to—if it's indoor or outdoor, a seasonal or year round allergen—makes all the difference. You do not experience an allergic reaction on your first exposure to an allergen. It takes multiple exposures to develop an allergy. An allergy starts when your immune system mistakes a normally harmless substance for a dangerous invader. 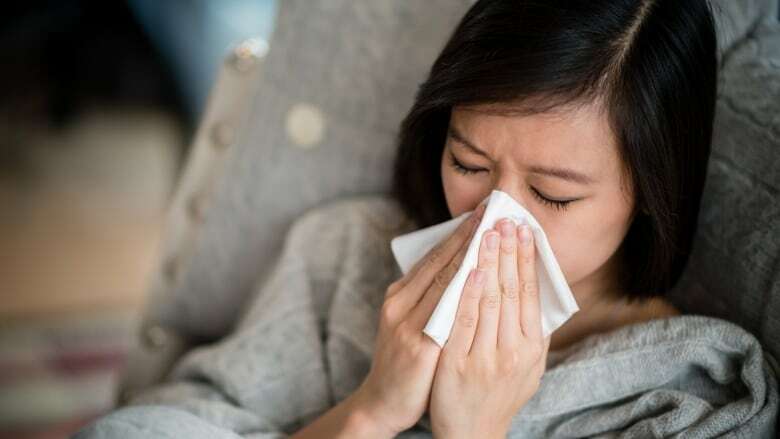 When you're exposed to the allergen again, these antibodies can release a number of immune system chemicals, such as histamine, that cause allergy symptoms like itchy watery eyes, runny nose and coughs. Can cleaning really help cure? It does if you're allergic to indoor allergens such as dust mites, cockroaches and molds. 1. Using a feather duster: People think they're dusting, but the duster makes things fly up in the air. Use a damp cloth instead. That will trap allergens instead of knocking them in the air. 2. Issues with clutter: Lots of people clean around their clutter, but they don't clean the source. Try tidying up or putting away some of your knickknacks so there are fewer places for allergens to collect. 3. Not checking the window sill for mold: This is an often overlooked place for mold to form, but it's where lots of moistures accumulates. Keep an eye on these areas around your home. 1. Cover your mattress and pillows in dust-proof covers. 2. Wash sheets every week in hot water. 130 F is hot enough to kill dust mites. 3. Dust mites are attracted to moisture, so keep the humidity levels low: less than 50% is recommended. 4. Use a HEPA vacuum cleaner in conjunction with a steam cleaner every eight weeks. 5. Reduce the amount of unnecessary upholstered furniture like throw pillows. 6. Reduce the amount of clutter. 7. Every type of flooring is a potential breeding ground for allergens; having tile or hardwood floors reduces exposure to triggers. 8. Generally speaking replace mattresses every 10 years. 9. Keep pets out of your bedroom (cats are more allergenic than dogs). The term "black mold" can be confusing, since many indoor molds are black or greenish black. Stachybotrys is often the mold people refer to as black mold, but there are other common molds such as aspergillus that can commonly be found in homes. Molds have the potential to be dangerous if one is allergic, has lung disease, or a compromised immune system. However, we are all exposed to molds and most do not experience any health effects. Determining the specific type of mold is generally not necessary and can be expensive since you need to have it tested under a microscope. So keep it simple remove all mold you might find. If you find mold by your indoor vents this suggests that there is a problem with moisture and condensation. In addition to removing the visible mold with a bleach solution (alternatively can use a vinegar solution) the vent and surrounding ducts should be examined professionally. This will help determine the source of excess moisture and let you find out if there is a larger mold source, which can often be the case. As creepy as it is to hear, cockroach saliva, droppings, and shed skin have been linked to asthma and allergy symptoms. One more reason to keep your kitchen tidy! 1. Regularly give your fridge a clean and scrub to avoid accumulating old food that could be a breeding ground for mold. 2. Scrub deep and clean caulking by the sink or any wet areas. 3. Make sure that you're checking and fixing any water leaks. 1. Look out for leaks, as mold grows around the caulking the shower or bathtub. 2. Keep carpet out of the bathroom, but smaller washable rugs that you can throw in the wash are okay. 3. Keep surfaces and the air as dry as possible. 4. Once a month, scrub down your shower curtain or put it in the wash. There are a lot of commonly held misconceptions out there about allergies. Let's bust a few myths. 1. True or False. Nasal decongestants are an essential long term treatment for allergy relief. FALSE: Over-the-counter nasal decongestants, can provide excellent short term relief, but are only recommended for a few days use at a time. Long term use can lead to dependence and even worsening of the congestion. Nasal steroid sprays, if used properly, can be used for long term relief. 2. True or False. Sticking to hypoallergenic products is the best way to avoid an allergic reaction. FALSE: The term "hypoallergenic" isn't actually regulated. Getting tested, knowing what you're allergic to, and avoiding that specific allergen is the best way to avoid an allergic reaction. On a similar note "all natural" does not imply "allergen free." We can develop allergies to natural plant products. 3. True or False. People with higher stress levels report more allergy symptoms. TRUE! Getting a good night's rest, exercising regularly and having a well-balanced lifestyle to reduce your stress may also help improve your allergies. 4. True or False. Eating local honey is the best natural remedy for treating allergies. FALSE! Some people believe this sweet treat is a natural remedy for pollen problems. But most pollen allergies don't stem from the type found in honey. That means that a jar of it won't help you build up your immunity. So, enjoy honey's taste, but know that even local kinds probably won't ease your symptoms. The most natural remedy would be a saline sinus rinse. The only way to truly build up a tolerance to the allergen as a potential cure is to undergo allergy immunotherapy. That means getting regular injections or tablets under the tongue. People interested in this option should see an allergist. 5. Children should not take allergy medication. The best remedy is for them to fight it off naturally. FALSE! Natural solutions are great, but allergy medications specifically formulated for children can be safe and effective for children, provided that this is discussed with the child's healthcare provider. The decision to use medications depends on the severity of symptoms and how they impact the child's quality of life. 6. Drinking alcohol makes allergy symptoms like stuffy nose and itchy eyes worse. TRUE! This is commonly reported. Beer, wine and liquor contain histamine, produced by yeast and bacteria during the fermentation process. Histamine, of course, is the chemical that sets off allergy symptoms. Wine and beer also contain sulfites, another group of compounds known to provoke asthma and other allergy-like symptoms. 7. True or False. Allergy tablets labeled non-drowsy usually still make sufferers drowsy. FALSE! Non-drowsy formulations are usually well tolerated without sedating side effects. A minority of people may feel drowsy with certain tablets labeled as "non-drowsy" but there are several different allergy tablets to choose from. Talk to an allergist for additional options if these don't work for you.